Currents and arcing from a motor shaft through the bearings to ground can cause wear and damage to a motor. 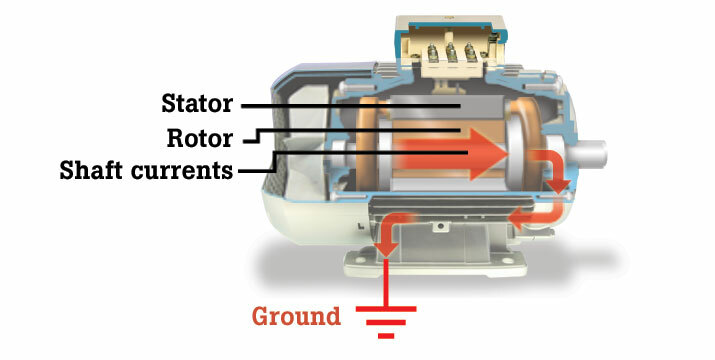 Motor bearings in electric motors suffer wear not only from shaft rotation, but also from electric currents from the motor shaft. When motor shaft voltages exceed the insulating capability of the bearing grease, flashover currents (sparking) to the outer bearing will occur, thereby causing pitting and grooving to bearing races. Such arcing will eventually lead to bearing failure and the damage ultimately can cause the motor to malfunction. The first signs of this problem will be noise and overheating as the bearings begin to lose their original shape and metal fragments mix with the grease and increase bearing friction. This can lead to bearing destruction within a few months of motor operation. Bearing failure is an expensive problem both in terms of motor repair and downtime, so helping to prevent this by measuring shaft voltage and bearing current is an important diagnostic step. Shaft voltage is only present while the motor is energized and rotating. Plus, shaft voltages and current spikes caused by the pulse width-modulated output of motor drives can be very brief, often in the microsecond measurement range. Thus a tool with high bandwidth as well as a carbon brush probe attachment that allows you to measure shaft voltage while a motor is rotating is ideal. 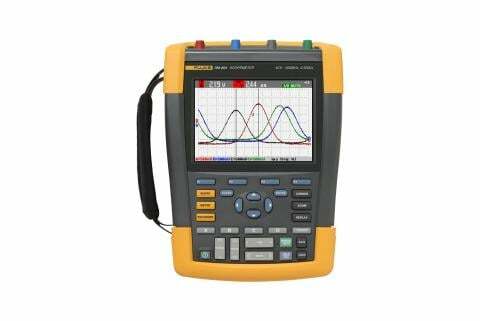 An instrument such as Fluke-190-204 ScopeMeter® isolated 4-channel portable oscilloscope, with AEGIS shaft voltage carbon brush probe, can measure and diagnose shaft voltage issues. Its high bandwidth and fast sampling rate make it well suited for measuring rapidly changing voltages and currents—far superior to a digital multimeter. Download "Measuring Motor Shaft Voltage and Bearing Currents with the Fluke 190 Series II ScopeMeter" to find out how voltage pulses from variable speed drives can impact bearing wear.